There’s not really a unique story about this granola other than the fact that homemade granola is one of my biggest weaknesses. My sister discovered this recipe via The Vintage Mixer not too long ago and made it when she came home from Michigan over the holidays. Homemade granola is actually super simple to make and well-worth the time, especially over the boxed kind. 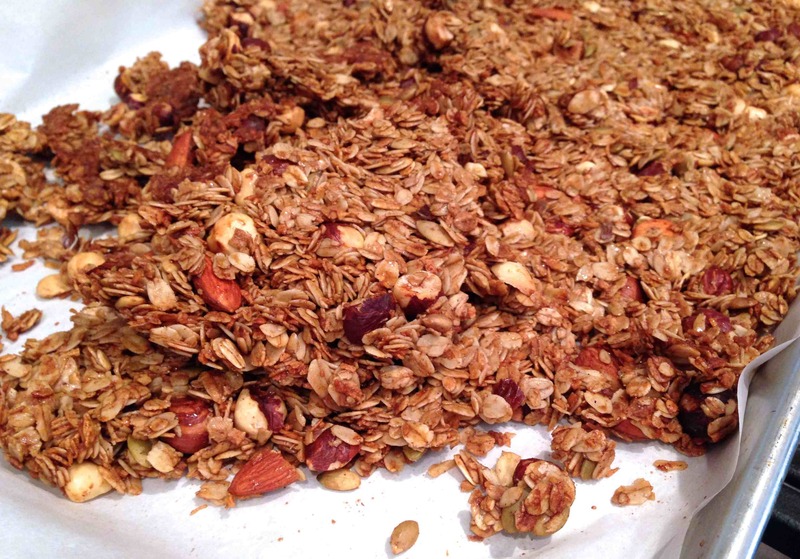 All you have to do is mix up the ingredients, bake it on a cookie sheet for 40-45 minutes, let it cool, and then break into large clusters or chunks of granola. It makes for a quick breakfast in the morning served atop plain greek yogurt or simply by itself for a snack. Mix coconut oil, maple syrup, molasses and brown sugar in a pot over medium heat. Stir in vanilla after removing from heat. 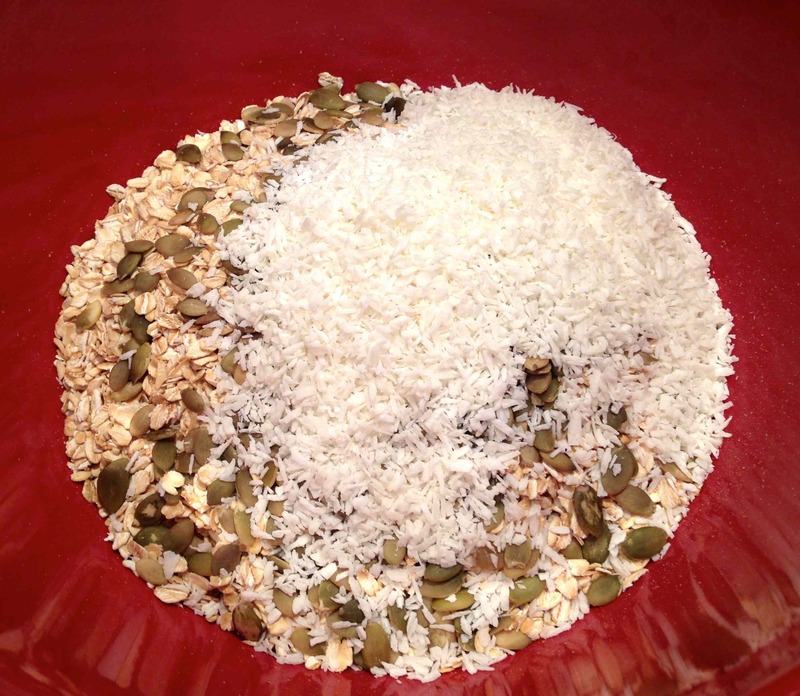 Mix together oats, pumpkin seeds, coconut, hazelnuts, cinnamon and salt. Pour syrup mixture over the oats. 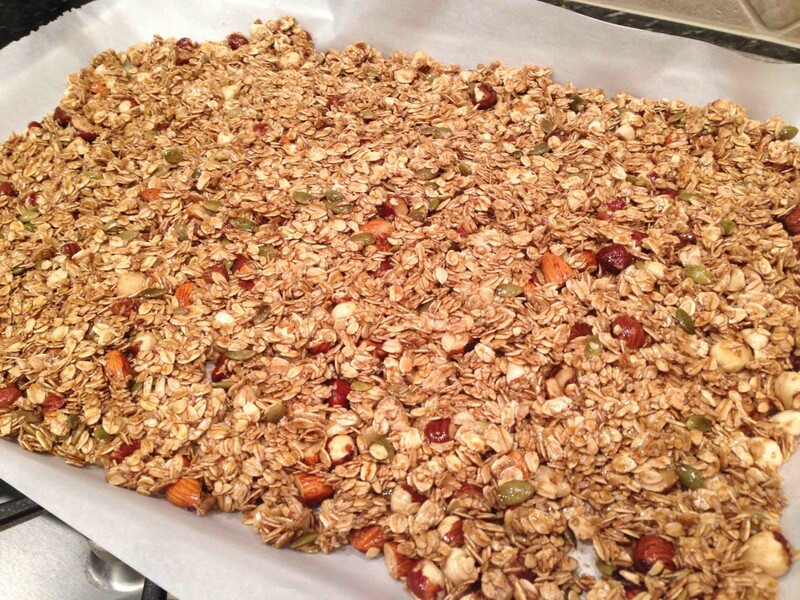 Fold egg whites into the oat mixture and pour out onto the baking sheet. Bake at 325 degrees for 40-45 minutes or until golden. Let cool completely, break into large clusters, then add in cherries/dried fruit. 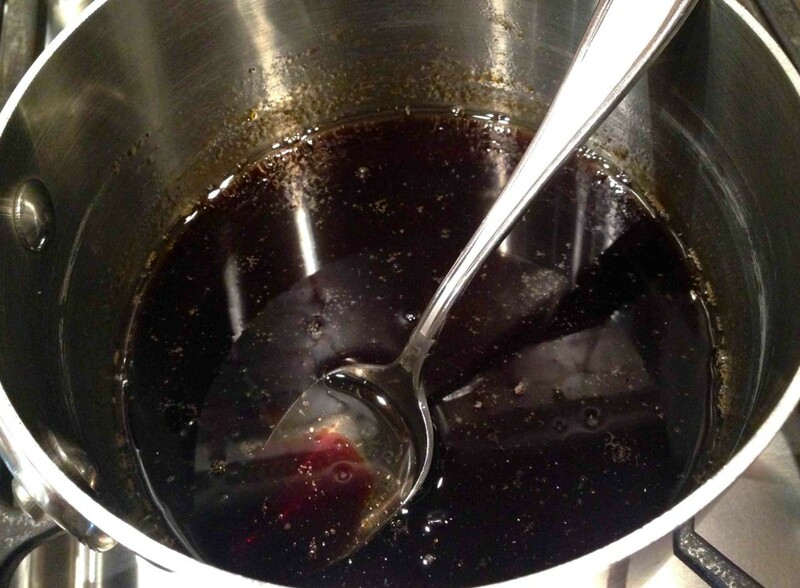 In a pot over medium heat, mix together coconut oil, maple syrup, molasses and brown sugar. Remove from heat and stir in vanilla extract. 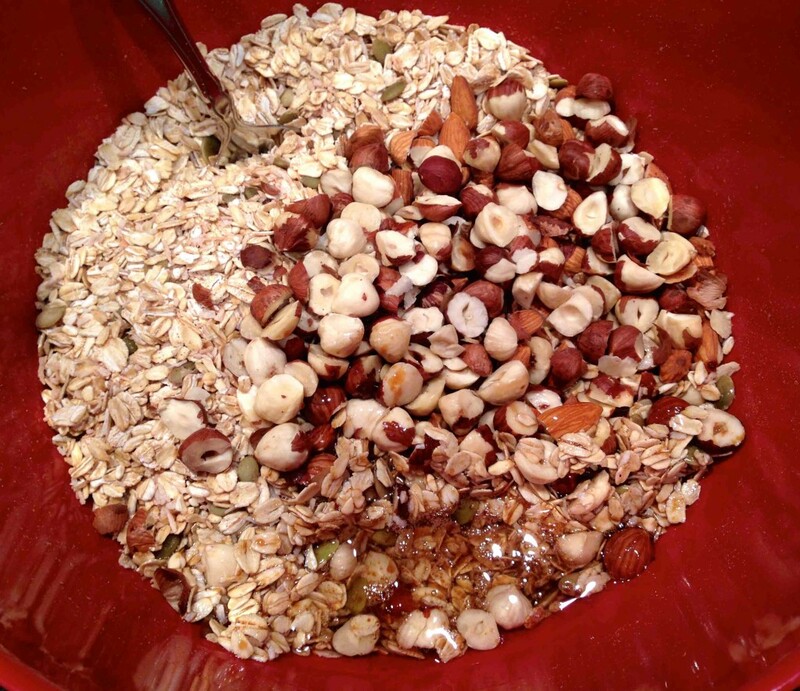 Meanwhile, in a large bowl mix together oats, pumpkin seeds, coconut, hazelnuts, cinnamon and salt. Pour the hot oil syrup mixture over the oats. Then, using a whisk, whip the egg white until its frothy. Fold the egg white into the oat mixture. Line a large baking tray with foil then pour out the oats onto the baking sheets. Bake at 325 degrees for 40-45 minutes or until golden. Don't stir this during baking or the clusters will break up. Let cool completely, then add in cherries/dried fruit and store in a large jar. The secret to making clusters in your granola is folding in an egg white before cooking, then not stirring the oats during baking. 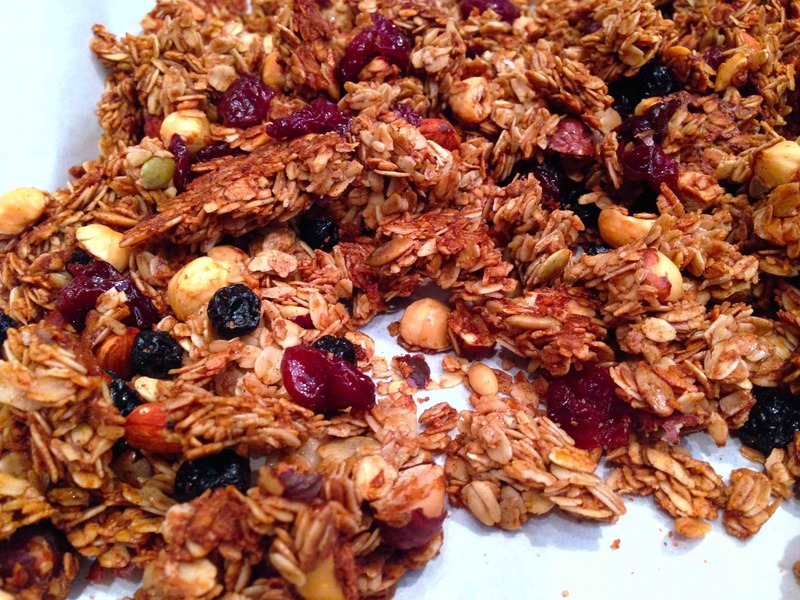 Also, do not toss the granola or break it up until after it has completely cooled.